The Black Friday Flash Sale template lets you send a sequence of emails featuring different products. It also lets you remind your customers about the time left until the end of the sale. It checks whether your contacts have bought your product to avoid sending them more emails. This way you can focus on the contacts who are yet to convert. Finally, it assigns them new tags to help you keep track which of the offers made them click. 2 automation messages or messages (or drafts) that can be used as one. 1. For the Message sent condition is preset to any message. Click the element to open the Properties tab select the sale announcement email you’ll be sending out. Be sure to schedule the message before you start configuring this element. The wait time for the condition should be set to 6 hours. After this time, customers who don’t complete their purchase will go down the negative path and receive a reminder email. For each of the Tag actions attached to the “if yes” (green) connector of the URL visited conditions, select the tag to assign to contacts who returned to your site and completed their purchase. You can use different tags for each of the products they’ve purchased. 1. 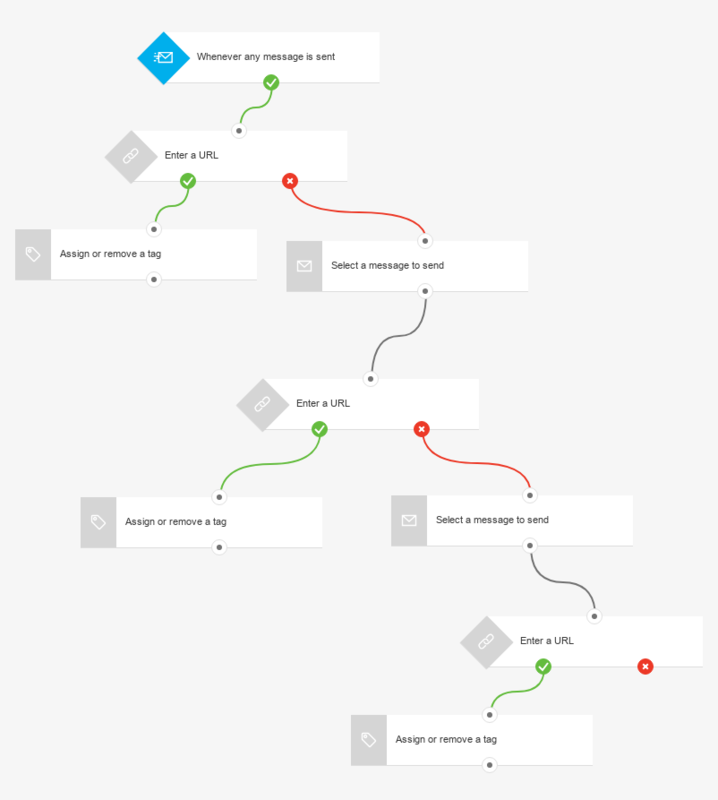 For each of the Send message actions linked to the negative (red) connector of the URL visited conditions, select the message with the follow-up offer. 2. In the remaining URL visited conditions, enter the URL post-purchase thank-you page for a given product. The wait time for the condition should be set to 6 hours. After this time, customers who don’t complete their purchase will go down the negative path and receive a reminder email.